...yep, a "dog praying". Well probably not praying per se but 'mimicking' his master praying. Isn't it cute? This dog is actually owned by a priest in a temple in Japan. 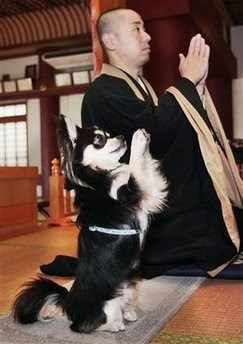 The priest said that the dog probably got the idea from their routine prayer. So what's next for Conan the dog, well the priest said that he's trying to teach him to meditate. LOL...well, more like staying still while they are meditating.